Contact person: Marián Polóni, Assoc. Prof., MSc., PhD. The Laboratory of Combustion Engines allows for measuring power, economic and emission characteristics of internal combustion engines in up to the power 230 kW/10000 min-1, or engines up to the power 400 kW/5000 min-1. The laboratory research focuses on applications of alternative fuels for internal combustion engines that are produced from renewable energy sources, especially on questions tackling mixture preparation and combustion, on tuning of engine parameters, on reduction of emissions of internal combustion engines, including reducing noise and vibrations, and on issues of electronic management of the engine. The laboratory also serves the needs of the teaching process, especially those related to bachelor, master and doctoral degree theses of students. Name of project: Combustion engines powered by fuels CNG and CNG-H2. 4) Polóni M., Kálman P., Lach J., Smieško Š., Lazar L., Kunc P., Jančošek Ľ.: Micro-cogeneration Unit with Variable–Speed Generator. International Scientific Event “Power Engineering 2010”. May 18-20, 2010, Tatranské Matliare, High Tataras, Slovak Republic. 9th International Scientific Conference: Energy-Ecology-Economy (EEE) 2010. Proceedings on CD, ISBN 978-80-89402-23-6. Paper address: CD/files/Eee/5/4, 22 pages. 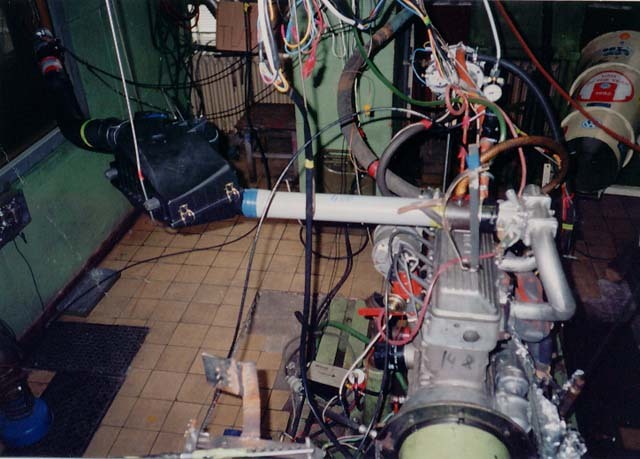 Anteneh Mohammed Tahir: Emission Optimization of a Bi-fuel Engine Powered by Compressed Natural Gas, dissertation, Slovak University of Technology, Faculty of Mechanical Engineering, Bratislava 2004. In the past few years the Laboratory of Internal Combustion Engines helped the researchers to carry out experiments within cooperative projects and implementation contracts. The companies in Slovakia benefiting from the cooperation are as follows: Slovenský plynárenský priemysel (Slovak Gas Industry) a.s. Bratislava, Lombardini Slovakia a.s. Martin, LIV Elektra a.s. Bratislava, Pohronské strojárne Hliník nad Hronom, Elteco a.s. Žilina, Elteco-Gen s.r.o Žilina, Engul s.r.o. Martin a Ekom s.r.o. Piešťany.